Philip Moscovitch (moscovitch.com) is a regular contributor to Saltscapes and Halifax Magazine, and his documentaries have been broadcast nationally on CBC Radio. Troy Merrick races up behind his former teacher, “Wildman” Gary Williams, and pummels him in the back of the head. The older man falls to his knees, and Merrick lays a boot into his back, knocking him to the floor. Most teachers wouldn’t appreciate being punched in the head, but these guys are professional wrestlers. It’s Friday night in Truro, Nova Scotia, and the two men are in the ring with fellow competitors Chris Cooke and Brody Steele as part of a tag-team match being held in a community-college gym. Two hundred and fifty fans, many of them children, have turned out to cheer and boo the local wrestlers they love—and love to hate. Old photos of Merrick show a chubby teen with bangs that hang low on his forehead. He says he was bullied as a child. “Growing up in a household with three women, wrestling provided me with positive male role models.” At five foot eleven and 185 pounds, Merrick is not a big man, but he lives by the credo of his childhood wrestling idol, Shawn Michaels: You don’t have to be big to be good. You have to be good to be good. Merrick used to work as a broadcast journalist. But last year, he left his job at a radio station in New Glasgow, Nova Scotia, to try to make it as a wrestler full-time. There’s a lot of travel and not much pay: this spring, he earned just over $2,000 for a month-long tour of the United Kingdom during which he wrestled thirty times in twenty-seven days. But there’s an easy camaraderie among the performers, and the audience is committed. A few rows back from the ring, a man proudly wears a T-shirt with the words “Our wrestlers are just as good as the ones on TV” in a handwritten scrawl. 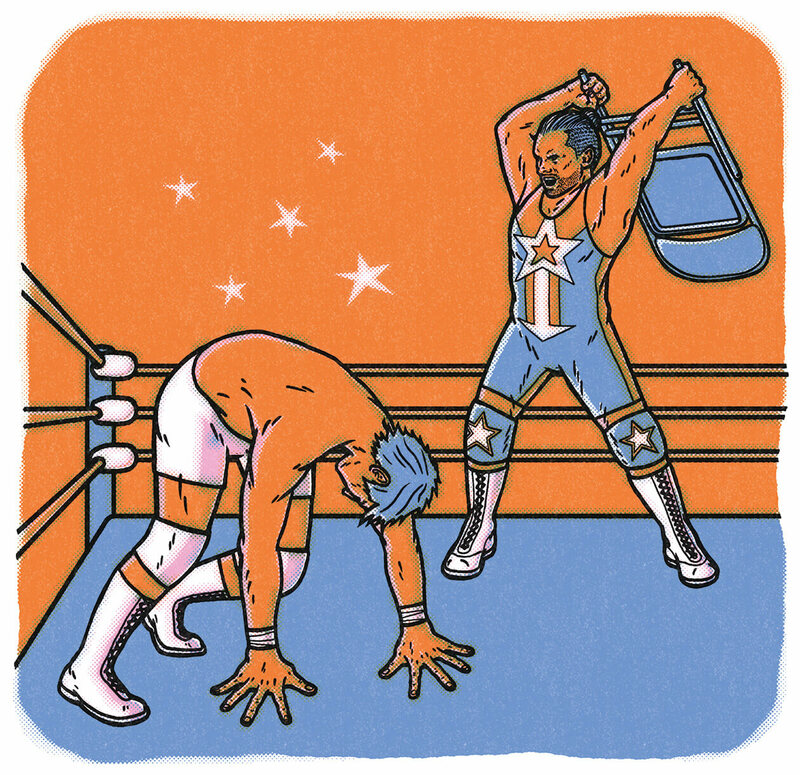 Strangely enough, the recent upswing in the fortunes of industry giant World Wrestling Entertainment—which drew more than 100,000 fans to Wrestlemania in Dallas this year and has its own cable network—seems only to have helped the local wrestling scene. 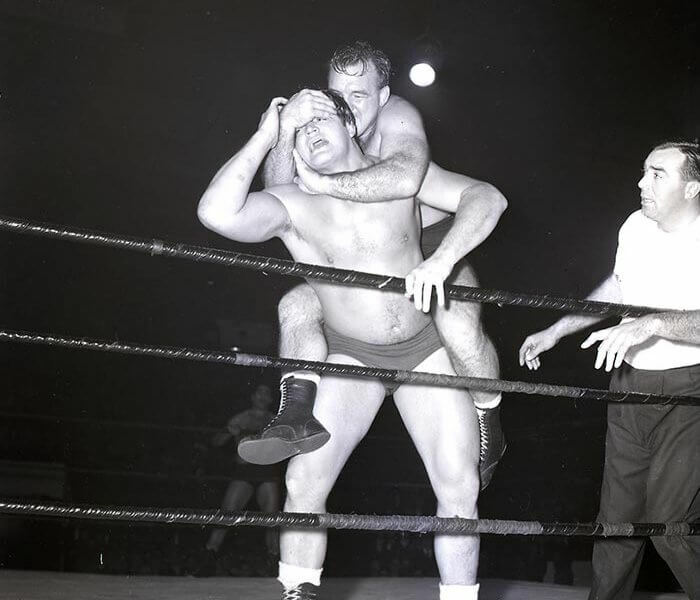 Fans can watch wrestling on TV any time, but that hasn’t stopped them from heading out to matches in a daisy chain of small towns across the region: Amherst, Pictou, Stratford, Bathurst. There isn’t much glamour in independent wrestling. Small towns, fast food—and, tonight, a locker room with poor shower pressure and blocked toilets. But that magic Brown talks about keeps wrestlers like Merrick climbing back into the ring night after night. “If you can really feel the crowd, if you can feel your opponent and know what’s coming and know how to work, that’s truly what brings out the power of wrestling,” he says. A couple of hours earlier, Merrick and Williams sat at a nearby Tim Hortons eating grilled-chicken wraps and deliberating over the number of calories in a strawberry-shortcake doughnut. Now they’re punching, kicking, and stomping each other with panache, and, after a strong start, things aren’t going so well for the American Patriot/Steele tag team. The Patriot leaps onto local boy Cooke as a prelude to a new jump-and-twist move Merrick wants to debut. But his timing is off—he winds up underneath Cooke instead. Before long, Merrick is pinned under Williams, the ref counts to three, the bell rings, and the men separate. As they leave, Steele glares hard at Merrick—the partner who has let him down in the ring. The two men walk down the makeshift aisle toward the backstage area. Once behind the black curtain, they grin and shake hands. As they return to the locker room in the basement, heavy metal, punctuated by the occasional air horn, plays in the gym. The black curtain pulls back again, and “Country Idol” Kris Hicks, dressed in a black cowboy hat and unbuttoned plaid shirt over tight shorts, steps into the ring. Then sixteen-year-old Maddison Miles—the only woman on the card, wearing a T-shirt that says “Because rings are for girls”—makes her entrance, running down the aisle and slapping fans’ hands. Within minutes, the next match is underway. Mark Cabuena had his artwork chosen for American Illustration 27.